approximately 30 minutes. Before administration ensure that the powder has been fully dissolved in the solution. **Intramuscular route of administration is indicated only for mild to moderate, uncomplicated or complicated UTIs due to E. coli when the intramuscular route is considered to be a more appropriate route of drug administration. The maximum dose for pediatric patients should not exceed the recommended adult dose. The usual recommended dosage in pediatric patients up to 40 kg in weight for uncomplicated and complicated urinary tract infections (including pyelonephritis), uncomplicated skin and skin structure infections, and pneumonia is 50 mg per kg per dose, administered every 12 hours (50 mg per kg per dose, every 8 hours for febrile neutropenic patients), for durations as given above. 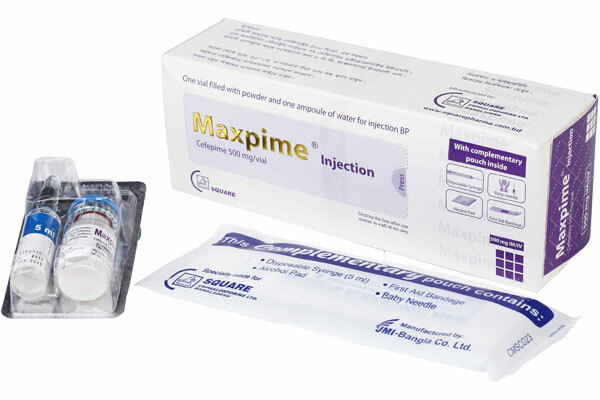 MaxpimeTM 500 IM/IV injection: Pack of 1 vial contains Cefepime 500 mg accompanied by a solvent ampoule of 5 ml water for injection. It also contains a complementary pouch comprised of disposable syringe (5 ml), baby needle, alcohol pad and first aid bandage. 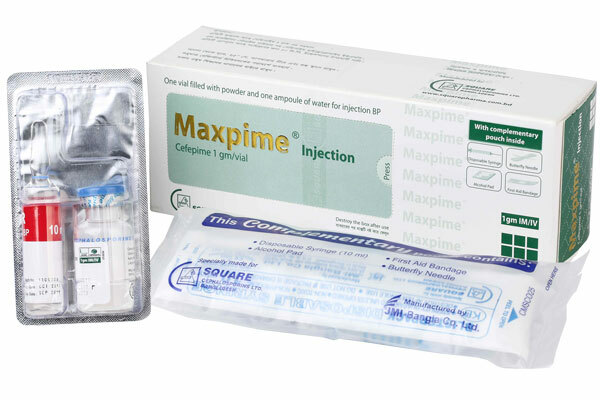 MaxpimeTM 1 gm IM/IV injection: Pack of 1 vial contains Cefepime 1 gm accompanied by a solvent ampoule of 10 ml water for injection. It also contains a complementary pouch comprised of disposable syringe (10 ml), butterfly needle, alcohol pad and first aid bandage.